People have been looking for an escape from New York City pretty much since the moment it was founded, and the breezy beaches on the islands at the South end of Brooklyn quickly became a popular spot to do just that. The first developments on the shores of Coney Island were built back in the 1840's (mostly old-school bath houses, oyster bars, and a building shaped like an elephant), and ever since then, it has morphed into its own kind of quirky boardwalk with some really out-there amusements and attractions. The first incubators for babies were attractions on Coney Island, because hospitals didn't believe that they would help premie babies survive any longer, and developers of Coney's amusement parks figured that they were weird enough to draw in some attention. It's definitely an escape befitting Brooklyn, home of most things offbeat, odd and interesting. Here's a guide to present-day Coney Island, and all the weirdness you can find a short trip away from the city! Back in its heyday, Coney Island was home to three amusement parks, called Steeplechase Park, Luna Park, and Dreamland. Eventually all were closed, and replaced with a smaller park called Astroland. Astroland then closed, and another version of Luna Park opened up in 2013. The new Luna Park has tons of rides, and they currently operate the infamous Cyclone, a wooden coaster that's been thrilling riders sine 1927, making it one of the oldest rollercoasters in America-- it's even on the National Register of Historic Places! Another famed Coney Island ride most are probably familiar with is the Wonder Wheel, also built in the 1920's and still kickin' today. If you dare to ride it, you can choose between a fixed car and a swinging car, which rocks and sways as the wheel turns. Throughout the island, you'll find other vintage rides, like carousels and bumper cars, mixed in with really modern coasters-- have you seen the Thunderbolt yet? It has three loops and a 90-degree drop. Jeez! The hot dogs and historic rides aren't the only old-school attractions you can find on the island-- you can also go see an authentic circus sideshow! From sword swallowers to fire-eaters and more, the Coney Island Sideshow and Museum's rotating cast of characters will definitely fill the crowd with shock and awe. It's relatively cheap for a show, which features around 10 acts, with tickets costing around $10 a pop. They also offer classes, in case the show inspires you to try your hand at juggling chainsaws or something. 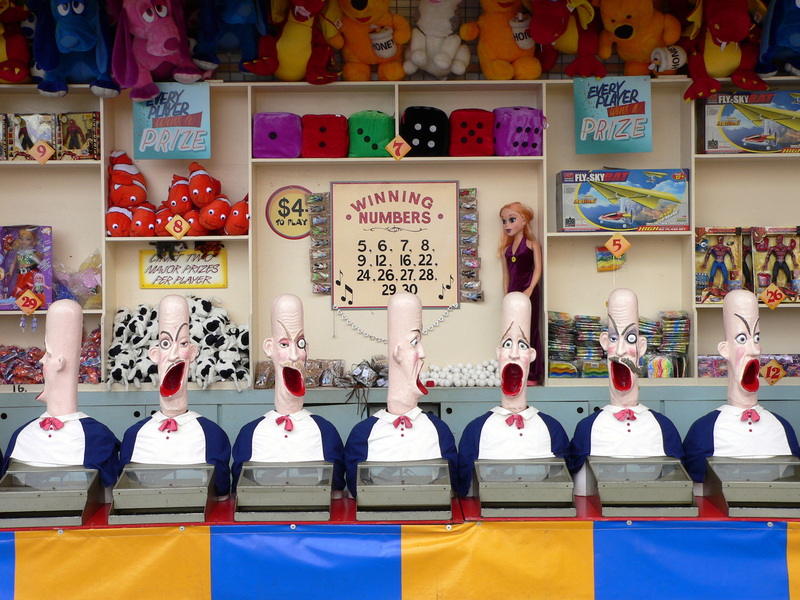 At the Coney Island Sideshow's museum, you'll find one of one most notorious hoaxes in all of history: P.T. Barnum's Feejee Mermaid. In the early 19th century, Barnum began to advertise an exhibit featuring a "real-life" mermaid at his notorious American Museum. Barnum's museum mostly displayed freaks, exotic objects, and other bizarre attractions, and the mermaid (which was pretty obviously the top half of a monkey sewn onto the bottom half of a fish) fit right into his collection. Some hold that Barnum's mermaid was lost to one of the many fires that tore through his museum, while others claim it lives on the the Sideshow Museum. Or, better yet, embrace the mermaid lifestyle for yourself. Coney's annual celebration of the start of the summer season is typically not-typical: it's a Mardi Gras-esque Mermaid Parade through the neighborhood. There's always a King and Queen, and lots of floats and crazy, elaborate costumes and contests (they encourage bribery in the contests, so if you're looking to win, you know what to do) during the event, which is always held the Saturday closest to the first day of summer. It's been a beloved tradition since the 1980's, and has inspired other mermaid parades across the world. Of course, you won't find any more wild than Coney Island's. Grab some shells and facepaint and join the fun! Nathan's Famous Hot Dogs have almost become synonymous with "Coney Island". What started out as a Coney Island nickle hot dog stand run by a Polish immigrant in 1916 has quickly become one of the world's most-craved wieners. Al Capone, Eddie Cantor and Cary Grant all enjoyed Nathan's Famous Hot Dogs back in the day, but they really became famous when President Franklin Roosevelt served them to the King and Queen of England, and had them shipped to Yalta during a meeting with Joseph Stalin and Winston Churchill. Nathan's is also famous for their annual July 4th Hot Dog Eating Contest-- it's like the Super Bowl of Major League Eating (which, yes, is a real thing). Hot dogs, amusement parks, tourists, freaks... Coney Island is already a pretty good representation of America, and the fact that they have their own minor league baseball team only adds to that. The Brooklyn Cyclones, whose stadium, MCU Park, is just off the boardwalk, were named after the rollercoaster via a contest. They've been around since 2001, and are much beloved by their borough, which, despite their love of baseball, has been without a team since the Dodgers left for Los Angeles in the 1950s. In fact, the team's mascots, Sandy the Seagull and Pee Wee, are named for Brooklyn Dodgers players Sandy Koufax and Pee Wee Reese. Like most minor league teams, they boast an awesome schedule of events and themed nights, like 90's Nickelodeon night, Italian heritage/Frank Sinatra night, post-game fireworks, pre-game catch on the field, and tons more. On your way out of Coney, stop by one more weird attraction: the Quester 1 Abandoned Submarine. Originally built by a treasure hunter who wanted to use the sub to resurface the Andrea Doria, the sub rolled over and sank on its maiden voyage. It remained docked until a storm washed it out into the creek, where it remains to this day. Whatever kind of offbeat adventure you're looking for, you'll find it on Coney Island. It's the perfect dreamlike summer escape from the hustle and bustle of the city... honestly, it feels like a whole other time and place!